As you can see, this pattern can be used for many things. This book is an easy read an has stories that everyone can relate to. Yes, there was even a punk rock/moshing story! Great easy read, worth your time and money. This review was written as part of the Catholic book reviewer program from The Catholic Company. 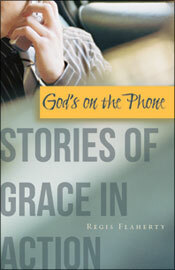 Visit The Catholic Company to find more information on God's on the Phone. This is also a great Catholic gift store for all your seasonal shopping needs, such as Christian wedding gifts and Catholic Garden Gifts.